Mistakes happen. C’est la vie. A chicken died unnecessarily. It happened this past holiday weekend. A whole chicken was brought for one dollar a pound, that’s a good deal for a free-range, drug free chicken. July 4th weekend was spent enjoying festivals and seeing friends. We forgot and didn’t have the time to properly clean and freeze the poor bird. When it was time to season it for dinner, it wasn’t good to eat, because it had spoiled. In this household, it’s not about the money that was wasted. It’s about a life that died unnecessarily, but karma has its ways of returning full circle. With a spoiled chicken, a menu had to be changed. Salmon was brought to quickly replace the chicken. Remember, the chicken was brought for one dollar a pound. It would’ve lasted two or three days, including “brown bagging” it for lunch. In New York City, lunch will cost an average of $10.00, if one is conscience about eating healthy. One pound of salmon will last for one day. 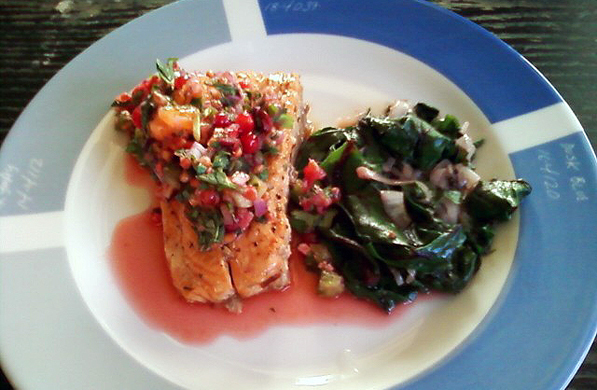 So, I may have cooked a fabulous Salmon with Red Currant Salsa, but I can’t “brown bag” it for lunch the following day, because I try not to leftover fish, unless it’s a canned tuna salad. Read more and get the recipe at www.MyLifeRunsOnFood.com.